ClearCorrect is a series of clear, custom-made, removable aligners that gradually straighten your teeth as you wear them, each aligner moving your teeth just a little bit at a time. 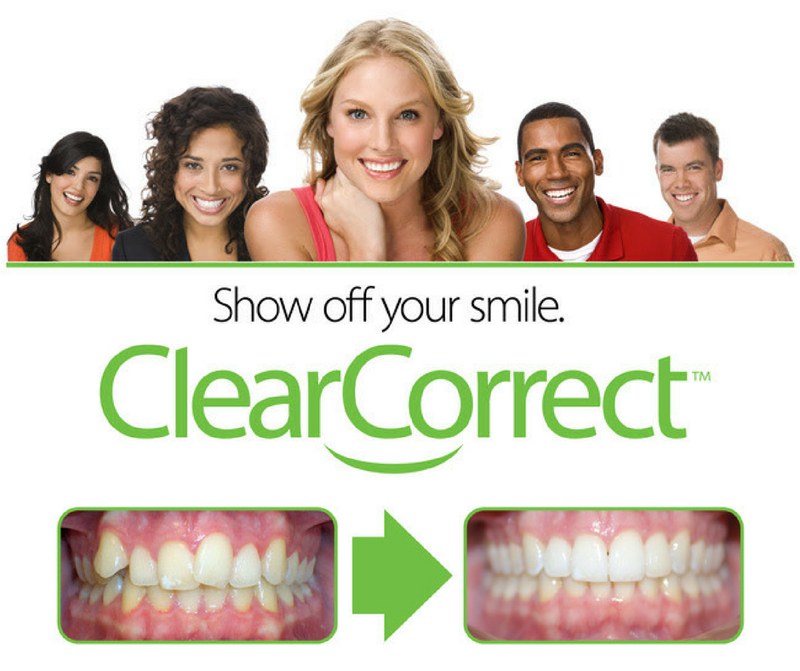 ClearCorrect is a great solution for patients who want straight teeth, but do not want to deal with the wires and brackets that come along with traditional braces. A very exciting day for our ClearCorrect patients is when they come in for their first set of invisible aligners. To share some of that excitement with you we have outlined the process of getting your aligners and even have included a video for you to watch. When you arrive at your appointment you will be handed a tooth brush. You will then head to the bathroom to brush your teeth. Once your teeth are clean you will be brought back to the Orthodontic room to receive your aligners. It is important to always clean your teeth before putting on your aligners. We will unpackage your first set of aligners and explain how to put them on.. Once both the top and bottom aligners are in place on your teeth we will provide you with a chewie. A chewie is an aligner tray seater that you will chew on to completely seat the trays in place. You will chew on it all around your teeth along the aligners. Your chewie will be something that you use every day for 5-10 minutes. Once your aligners are in we will ask you questions about the feel of them and make sure they are seating in place right. In some cases, some small adjustments can be made in office to provide the correct fit. We will then go over with you how to remove your aligners and show you the tool provided by ClearCorrect that can aid you in the removal of the aligners. Next, we provide you with all your ClearCorrect goodies that you are going to need. Including a case for your aligners, additional chewies, and more. We will go over how long you must wear them, when to take them out, and when to change to your next set of aligners. Your next set of aligners will be provided at this appointment. Lastly, you have the opportunity to ask any questions you might have about your ClearCorrect Aligner trays. Before you leave we will schedule your appointment to come in for your 3rd and 4th set of aligner trays. If it is called for on your treatment plan this is also the appointment where engagers or inter proximal reduction (IPR) will be performed. Engagers are small temporary composite bumps that are bonded to the teeth. The aligner trays grip the engagers to gain leverage to move the teeth. An interproximal reduction is a procedure where small amounts of enamel are removed from the edges of crowded teeth. Are you interested in finding out if ClearCorrect is right for you? Give us a call today and schedule your FREE ClearCorrect consultation.